Multiple Elementary explores the elementary school classroom as a site of invention and reception of contemporary art practices. 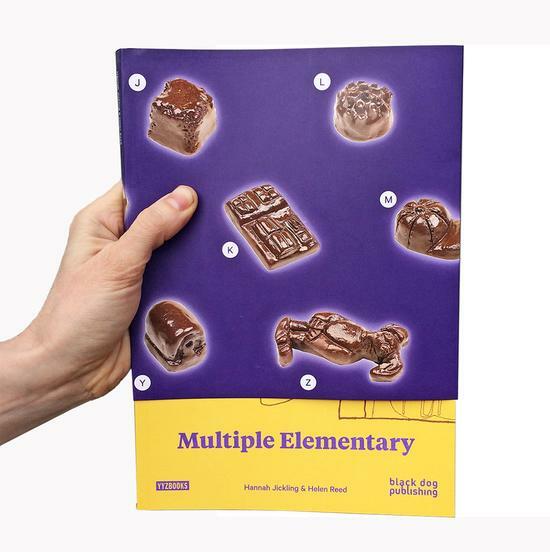 Part exhibition catalogue, part artists’ book and part corner store advertisement, the book reflects on the making of an artwork by Hannah Jickling and Helen Reed, in collaboration with a class of grade six students in Toronto. Begun as a riff on the Ontario social studies curriculum “Canada and It’s Trading Partners,” the engagement with students evolved as a series of field trips, extended research and finally, the making of 28 chocolates, each as an edition of ten. Explorations of trade, exchange and labour took shape as exercises in public engagement, curatorial experimentation and institutional translation. Beyond socially engaged practices and expressions of art-as-pedagogy, this book explores aesthetic and representative possibilities for process-based and publicly oriented artworks, especially amidst the complications and contradictions inherent to collaborations with children. This project is a precursor to Big Rock Candy Mountain, a project commissioned by Other Sights and supported by the City of Vancouver, the BC Arts Council, and the Canada Arts Council. Helen Reed and Hannah Jickling have been collaborating since 2006. Their projects take shape as public installations, social situations, and events that circulate as photographs, videos, printed matter, and artists’ multiples. They are currently fascinated with the contact high intrinsic to collaborative research, especially in their recent projects with children. Reed and Jickling have exhibited and performed internationally, with both individual and collaborative work, at The Portland Art Museum (OR), The Dunlop Art Gallery (SK), Smack Mellon (NY), The Vancouver Art Gallery (BC), and The Power Plant (ON). In Fall 2017 they released Multiple Elementary, a book that explores the elementary school classroom as a site of invention and reception of contemporary art practices, published by YYZBOOKS. Reed and Jickling are recipients of the 2016 Ian Wallace Award for Teaching Excellence (Emily Carr University of Art & Design), the 2017 Mayor’s Arts Award for Emerging Public Art (City of Vancouver) and the 2018 VIVA Award (Jack and Doris Shadbolt Foundation for the Visual Arts).